Check our E-BOOK If you want a beautiful skin without diseases! Tips for Sand Bath care the most relaxation for your body. A steaming sand bath is said to offer therapeutic relief from neuralgia, rheumatism, back pain and other ailments. You can regenerate your old body by getting into a steaming hot sand bath. The aches and pains will just drift away and you are regenerated. In Japan, many are looking for unique ways to keep warm, while reaping health benefits. The warm sand by the sea in Kagoshima is among the hottest around the globe. The closer one gets to the shore, the hotter it gets. At some places, it is regarded to be around 85 degrees Celsius, while the maximum temperature most people can withstand is around 50 degrees Celsius. Although the mechanism is said to be unknown, it is said to be the only such place in the world. Kazufumi Tateyama, SandBath Hall Saraku said: "For women, it is effective for those who have badcirculation, shoulder aches and lower back pain joint issues. For theskin, it said to be good for those with skin diseases." The steam bath at Ibusuki in Japan have a recorded history of about 300 years. Since the late 1800s to 1930s, sand bathing has developed into a popular form of therapy and treatment, which in turn has prompted some 60 inns to sprout here. And since the early days, many visitors believe that a good sand bath is able to keep the doctor away. Kagoshima University conducted a research study in 1985, to examine the effects of the sand bath on blood pressure, cardiovascular system, and respiratory system. 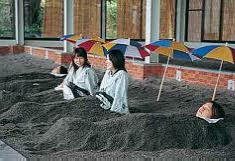 It believed the sand baths at Ibusuki are three to four times more effective than the average hot spring. Aside from the therapeutic effect, it helps to cool in the summer and warm up in the winter, and it is no wonder that it attracts 500 to 600 visitors daily. Balneotherapy is an accepted therapeutic approach in Europe.There are different balneotherapy modalities: Radon-carbon dioxide baths, mud packs, hot sulphur baths, Dead Sea baths, Red Sea baths, and grey sand. Several types of balneotherapy, including radon-carbon dioxide baths, mud packs, hot sulphur baths, combination of hot sulphur baths and mud packs, Dead Sea baths, combination of Dead Sea baths and sulphur baths, and Grey sand and Red Sea baths were found to be beneficial for RA. These modalities were found to be especially beneficial for pain, grip strength, tender/swollen joints, patient and physician, and global function. These improvements ranged from 5-93% greater improvement relative to the control group. However, methodological considerations including the poor quality of trials impact the conclusions of this review.